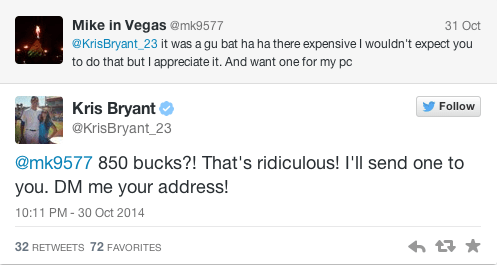 Bryant wasn’t lying. 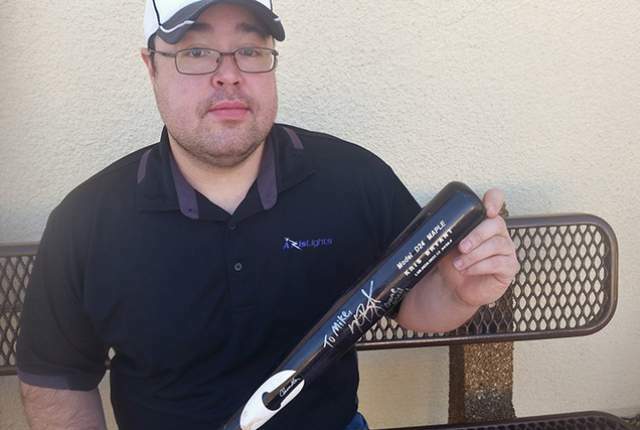 The bat showed up Thursday and Kennedy showed it off in this picture. In my opinion these things go way to unnoticed in sports today. We as fans and media are so quick to judge an athlete when he/she does something questionable but when an athlete does something like this we never talk about it. Yes, this the first feel good story of this Thanksgiving day. Feel good stories typically do not read or shared or even acknowledged. But I believe that it should be read, shared and applauded. Bryant hit 44 home runs in 2014, but I think it is safe to say that we can add 1 to his total for hitting this one out of the park! This article is based on an original story by Mike Oz for Big League Stew.